EDUCATION University of Tennessee, B.S. Kristi Pickens joined Moore Ingram Johnson & Steele in May 2018 and works out of the firm’s Knoxville, Tennessee office. Kristi’s area of practice is focused on Workers’ Compensation Defense. Kristi received both a B.S. in Communications and a Master in Public Administration from the University of Tennessee, Knoxville. 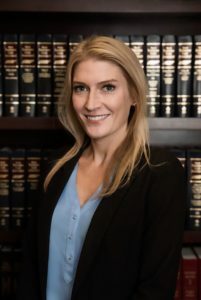 After working in communications and marketing for four years, she attended Belmont University College of Law, earning her J.D. in 2014. While in law school, she competed in moot court as a member of Belmont’s Board of Advocates. Kristi is admitted to practice before all Tennessee state courts and the United States Federal Court, Eastern District of Tennessee. Prior to joining Moore Ingram Johnson & Steele, Kristi practiced in the areas of domestic relations, real estate law, and civil litigation. Kristi lives in Knoxville with her husband and son. She enjoys spending time with her family, traveling, watching college sports and visiting the Great Smoky Mountains where she grew up.